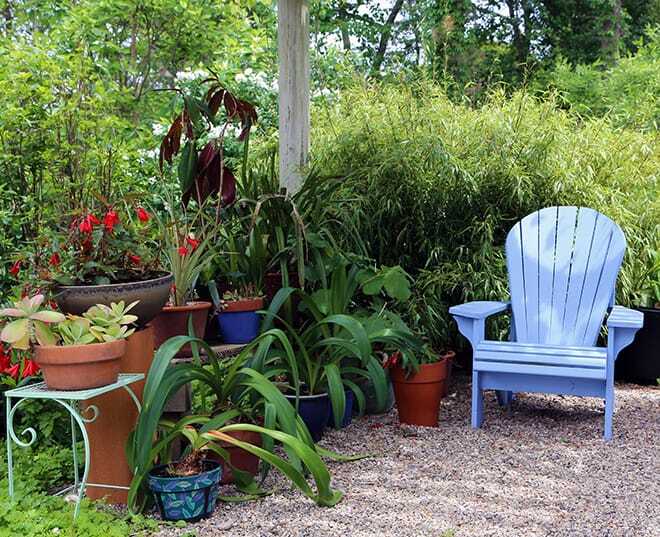 Imagine: You’re sitting under the arbor, surrounded by potted plants. It’s a mild June evening, and as you relax into your chair you catch a sweet fragrance that smells like orange blossoms. You smile, knowing without turning around that the Philadelphus is back in bloom. See the white flowers to the left of the post? That’s a ‘Snow White Sensation’ double mock orange. Type of Plant: Deciduous shrub that grows to between 5 and 9 feet tall, depending on variety. Hardy in Zones 5-8 (and maybe colder). Why I love this plant: I love this old fashioned shrub because of the lovely, fragrant flowers that it produces in May or June. This plant isn’t called “mock orange” for nothing, and in colder climates it’s the closest we come to having the fragrance of orange blossoms in our yards and gardens. The flowers are most fragrant in the evening and morning, so this is the perfect plant to place near those places where you might sit at the end of the day, or in the morning with your coffee. It’s a great “fire pit plant” – part of a screen of mixed white-flowering shrubs that give you a bit of privacy from the neighbors when you gather with your tribe around the fire pit. A Word to the Wise: Most mock orange varieties grow fairly tall, so place them where you won’t be fighting their size. 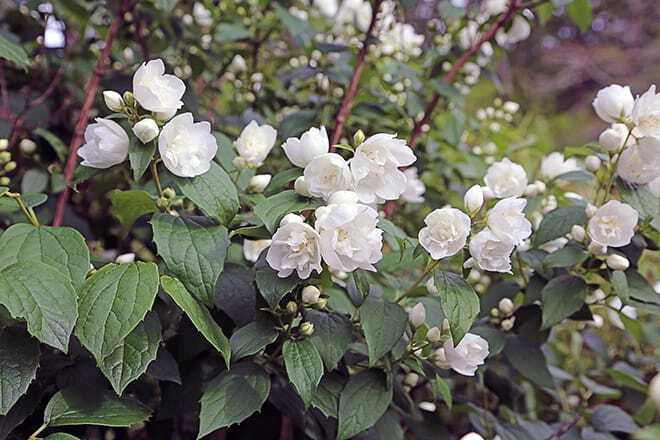 Although their flowers are beautiful and fragrant, this Philadelphus is only in bloom for about 3 weeks…so it’s perfect to combine with other deciduous shrubs that flower earlier and later in the summer. 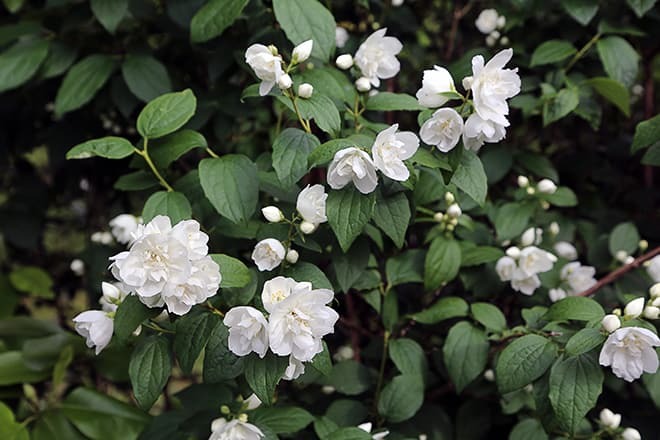 In fact, mock orange is a great component in a mixed-shrub border…just be sure to place it where you’ll be likely to sit and enjoy the fragrance when it’s in bloom. Know that this plant forms flower buds the summer before it blooms, so any pruning should be done right after it flowers. Plants that have been mal-pruned can be renewed by cutting all the way to the ground in the spring and letting the plant start fresh. Philadelphus can sucker, some varieties more than others, so don’t let your plant take over the yard or garden. 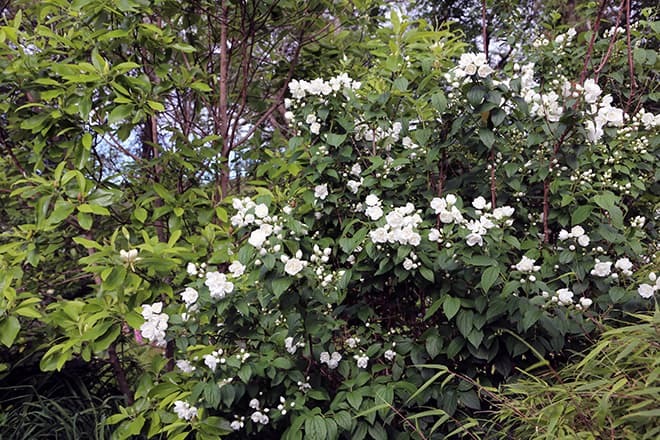 I have this mock orange, which is a Snow White Sensation, planted in my fragrance garden next to a sweetbay magnolia. The pure white flowers are so lovely against the dark green foliage on this plant. It’s the sort of shrub that surprises you every year with its beauty and fragrance.